Hey all, its sunset here, time to write some sunset shoujos. Manga origin, still ongoing. Anime aired for 24 eps with 3 OVAs. Storyline started off pretty slow, but after the story goes down, it became more and more entertaining. Plot twists are always pretty surprising. The comedy is pretty shoujo-like. Character development is pretty amazing. The pacing is more on the slow side with the 24eps. The climax isn’t exactly much, and the ending was rather inconclusive. The first OVA is a little bit on the fanservice side. The 2nd OVA is pretty great, and a little bit touching too. It did gave the yellow dragon a more in-depth history with the 2 eps. Overall, even with the inconclusive ending, the show as a whole is pretty solid. Animations by Pierrot. The overall quality is great. 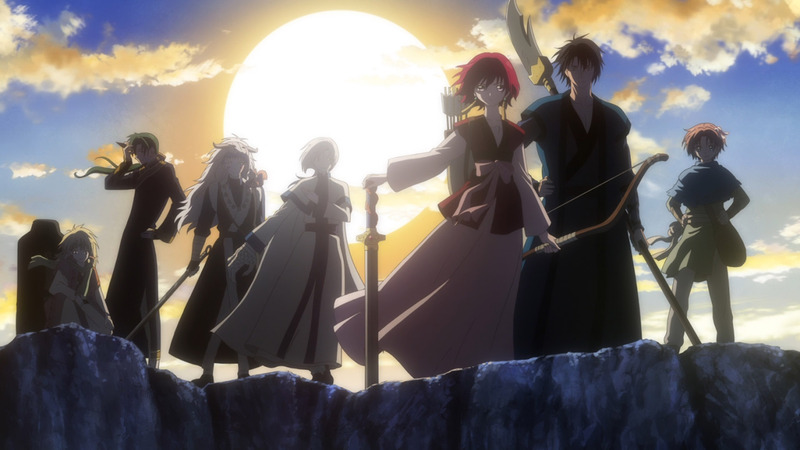 Character designs were nice, colors were vivid, reflecting on Yona’s splendid looking hair. Minor combat scenes here and there which is pretty decent. Music is another great thing. OP1 was a BGM, but it was really good. ED1 is good. OP2 was great with Cyntia. ED2 was fine. The OVA1 ED was damn nice, I became totally in love with Cyntia. OVA2 and 3 ED was decent. BGMs were nicely composed too. The cast list is pretty great. Saito Chiwa, Maeno Tomoaki, Takagaki Ayahi, Minagawa Junko, Kobayashi Yusuke, Yamamoto Nozomi, Morita Masakazu, Chisuga Haruka, Kobayashi Sanae, Okamoto Nobuhiko, Suwabe Junichi, Shimono Hiro, Kanemaru Junichi, Sakurai Takahiro, Ishida Akira, Nakaya Kazuhiro, Yoshino Hiroyuki, Kayano Ai, Hanazawa Kana. They did a good job, picking Saito Chiwa for Yona is a very excellent pick. Highly recommended for most shoujo fans out there. I love this show a lot, but Soredemo Sekai wa Utsukushii is still my top pick. ← 5k views of the year special: Shoujo Animes I love to bits.